Learn how to up the security performance of your application using a sidecar security proxy that can guard against brute force attacks and more. 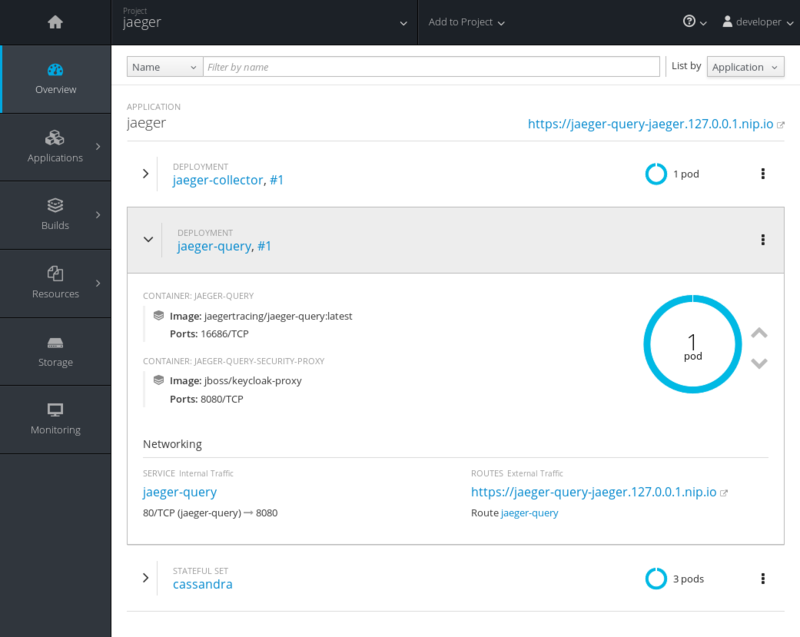 In a production deployment of Jaeger, it may be advantageous to restrict access to Jaeger’s Query service, which includes the UI. For instance, you might have internal security requirements to allow only certain groups to access trace data, or you might have deployed Jaeger into a public cloud. In a true microservices way, one possible approach is to add a sidecar to the Jaeger Query service, acting as a security proxy. Incoming requests hit our sidecar instead of reaching Jaeger’s Query service directly and the sidecar would be responsible for enforcing the authentication and authorization constraints. Incoming HTTP requests arrive at the route ①, which uses the internal service ② to resolve and communicate with the security proxy ③. Once the request is validated and all security constraints are satisfied, the request reaches Jaeger ④. Note that we are not trying to secure the communication between the components, like from the Agent to the Collector. For this scenario, there are other techniques that can be used, such as mutual authentication via certificates, employing istio, or other similar tools. For this demo, we’ll run Keycloak via Docker directly on the host machine. This is to stress that Keycloak does not need to be running on the same OpenShift cluster as our Jaeger backend. The following command should start an appropriate Keycloak server locally. If you already have your own Keycloak or Red Hat SSO server, skip this step. Login into Keycloak (http://<YOUR_IP>:8080/auth/admin/master/console) with admin as the username and password as the password. In the top left corner, mouse over the Select realm box and click Add realm. Name it jaeger and click Create. On Clients, click Create and set proxy-jaeger as the name and save it. Set the Access Type to confidential and * as Valid Redirect URIs and save it. You might want to fine tune this in a production environment, otherwise, you might be open to an attack known as "Unvalidated Redirects and Forwards." Open the Installation tab and select Keycloak OIDC JSON and copy the JSON that is shown. It should look like this, but the auth-server-url and secret will have different values. Under the Configure left-side menu, open the Roles page and click Add role. As role name, set user and click Save. Under the Manage left-side menu, open the Users page and click Add user. Fill out the form as you wish and set Email verified to ON and click on Save. Open the Credentials tab for this user and set a password (temporary or not). Open the Role mappings tab for this user, select the role user from the Available Roles list and click Add selected. For this demo, we assume you have an OpenShift cluster running already. If you don’t, then you might want to check out tools like minishift. If you are running a recent version of Fedora, CentOS, or Red Hat Enterprise Linux you might want to install the package origin-clients and run oc cluster up --version=latest. This should get you a basic OpenShift cluster running locally. We’ll use the Jaeger OpenShift Production template as the starting point: either clone the entire repository or just get a local version of the template. Note that we are only allowing users with the role user to log into our Jaeger UI. In a real world scenario, you might want to adjust this to fit your setup. For instance, your user data might come from LDAP, and you only want to allow users from specific LDAP groups to access the Jaeger UI. This value should be a location that is reachable by both your browser and by the sidecar, like your host’s LAN IP (192.x, 10.x). Localhost/127.x is not going to work. As a reference, here’s the complete template file that can be used for this blog post. During the first couple of minutes, it’s OK if the pods jaeger-query and jaeger-collector fail, as Cassandra will still be booting. Eventually, the service should be up and running, as shown in the following image. 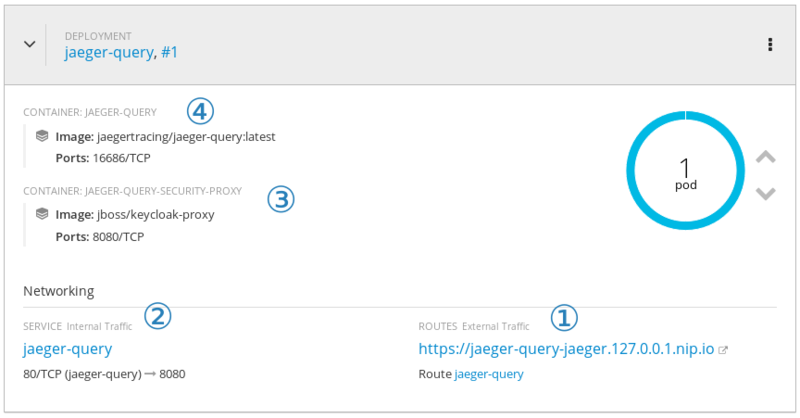 Once it is ready to serve requests, click on the URL for the route (https://jaeger-query-jaeger.127.0.0.1.nip.io). You should be presented with a login screen, served by the Keycloak server. Login with the credentials you set on the previous steps, and you should reach the regular Jaeger UI. In this exercise, we’ve seen how to add a security proxy to our Jaeger Query pod as a sidecar. All incoming requests go through this sidecar and all features available in Keycloak can be used transparently, such as 2-Factor authentication, service accounts, single sign-on, brute force attack protection, LDAP support, and much more.